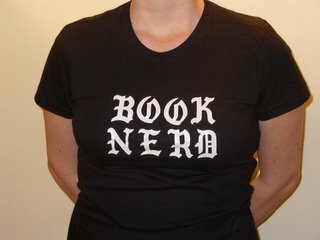 Greetings, fellow book nerds! I'm back from sabbatical, more or less, but I've realized the new schedule with BookStream et al. means that my blogging habits may need to change. Lucky for me this morning's Shelf Awareness led me to Booktrix, a book consulting company with a mandate as wide-ranging and hazy as mine at times, and to this post on the Booktrix blog, with the valuable advice: "Blog often, blog short, blog with pictures." I spent half of the "Digital Tools" panel at NAIBA telling booksellers that not every blog has to be the same format, length, or frequency, and that this doesn't have to take up all of your time. So I'm taking my own advice. I'll be posting (hopefully) a bit more, but in smaller bites. I've got a couple of Brooklyn Lit Life interviews in the pipeline, and a folder full of links and ideas to post. Today I'll pick just one. I was thrilled to get an email from Lauretta Nagel of Constellation Books in Reistertown, MD (outside of Baltimore). I chatted with her at the Emerging Leaders table at the NAIBA convention (her store is less than a year old). She attended the Digital Tools panel, and says that thanks to that she finally did it: she started a Constellation Books blog! It looks to me like everything a bookstore blog should be: timely, local, and personal. Congrats to Lauretta, and hooray for another addition to the ranks of bookseller bloggers!